This Craftsman Door is was designed for this Craftsman Home. The entire entry is built of Mahogany and consists of a 36″ X 96″ 8 lite TDL (true divided lites) over a V-Grooved Raised Panel with matching 14″ Sidelites. The glass is clear tempered insulated glass and the hardware is a Schlage Handleset. 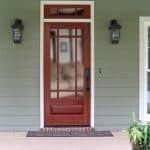 Doors by Decora is an Authorized Dealer for Schlage, Baldwin and most other major brands of Door Hardware.